Wondering what makes the best gift basket for family? Here we share top choices and some misses. The buying guide transforms you into an informed shopper. What is the best collective gift to get a family? Occasions like Christmas and Thanksgiving prompt us to think on a family level especially when family gatherings are concerned. It could initially be difficult to know what to settle for, but we are here for you. Here, you will find out our top picks for the best gift basket for family, along with two examples of what to stay away from. Additionally, we have a buying guide to help you make future decisions. Ultimately, you want something that will likely please every member of the family. Equally, you want to be considered thoughtful, which you evidently are if you are reading this article. If you are looking for a nutty affair to gift a family, then this is one gift basket you should consider. 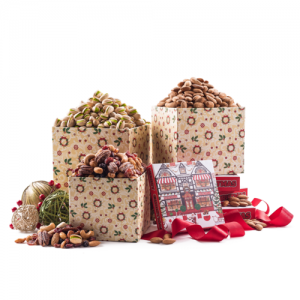 With over two pounds of almonds, roasted and salted macadamia nuts, pistachios, glazed honey pecans, cashews, walnuts and mixed nuts in the package, the recipients of this gift basket will be spoilt for choice. If the reviews on Amazon are to be considered accurate people appreciate the quality and freshness of this particular gift basket. When it comes to packaging, Hula Delights have done an excellent job. 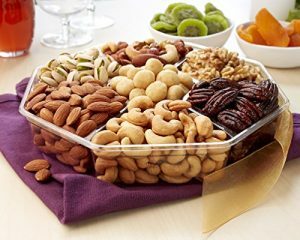 The transparent container immediately lets you know what treats you are getting, allowing you to pick out your favorites well before you open the gift. The octagon shape with a ribbon makes for an eye-catching packaging. What makes this gift ideal is that it is suitable for any season. Given that nuts serve as perfect snacks even for a mindful eater, everyone in the family is bound to enjoy these nuts. Even when you are going for Thanksgiving or a Christmas dinner, you can take these with you to serve as sides for the desert. However, before sending this gift, ensure that no one in the family has a peanut allergy. It is essential to make sure you do especially where toddlers or young children are involved. As mentioned, the reviews on Amazon and other sites indicate that this nut fruit basket by Hula Delights is a hit with many people. You only ought to ensure that the person or people you gift do not have a food allergy to avoid an awkward situation. The next item we have on our list is also a nutty affair. In it, you have over one pound of nuts they include walnuts, mixed nuts, pistachios, honey glazed roasted peanuts, cashews, candied pecans, and almonds. The company promises high-quality nuts that are picked and prepared with freshness in mind. This package of nuts is also in the form of a hexagon and has a ribbon attached. The festive packaging makes it ideal for any occasions but primarily family-oriented events due to the quantity. The products are kosher. With regards to preparation, the cashews, almonds, and pistachios are toasted for that crunch we all love, and lightly salted for taste. The family consequently gets a perfect balance of sweet and salty. As mentioned in the previous gift basket, ensure that the families you gift do not have a history of peanut allergies. Just as with the previous gift package, if those who enjoy nuts will be quite appreciative of this gift. However, you also don’t want to gift them to those who cannot take peanuts. While Hula Delights has shown itself to be a premium product, you can get this similar package for 10 dollars less. If the families you gift are brownie-lovers, they will be beside themselves with this gift basket. What makes Fairytale Brownies special is it begins with two childhood friends who transform a late night baking affair into a company. With every bar, cookie or brownie, they ensure the ingredients are the all-natural and among the best in the industry. From imported Callebaut Belgian chocolate, down the flour and eggs, they make quality a priority. 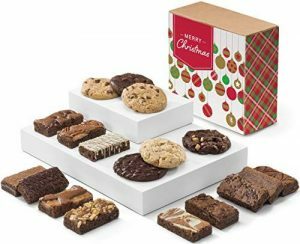 You can expect the recipient of the box to receive a fresh batch right at their doorstep because everything is made to order. They will also receive it in a custom fitted package. Overall, they can expect to get a unique gourmet experience that they will not forget. Handmade and top quality ingredients are all anyone can ask for. If you are into the social-good movement, then you will be proud to support Fairytale Brownies. They support an initiative known as KaBOOM! that seeks to build playgrounds across the country. This gift package is ideal if you wish to gift those living quite far from you. Alternatively, if you are looking for something that will not go bad fast, then this is the gift basket to consider. 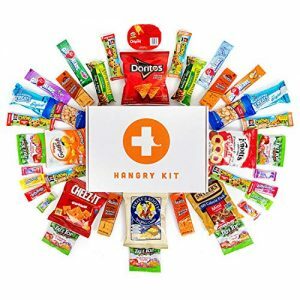 Most of all, if you are unsure what to go for, then you might want to select this Hangry Kit package as your gift basket. The reason to go for it is that you have the most popular snacks numbering at 40 within the package. There are not generic brands, but those considered to be the top around the globe. Whether for a big or small family, everyone is bound to get something that they will love and appreciate. The variety also makes it ideal for families despite what demographic they fall under. The long shelf life makes it best when traveling a long distance or for smaller families that are likely to take a while longer to get through the package. What you can expect in the package is Rice Krispies, Austin Peanut Butter Crackers, Nature Valley Crunchy Bar, Doritos Nacho Cheese, Air Heads, Laffy Taffy, Tree Top Fruit Snacks only to mention a few. If you are looking for something long lasting, then this item is for you. Shipping it to people far away or even nearby you have the peace of mind because everything has a longer expiry date. Nuts and dried fruits make for an excellent healthy combination any time. 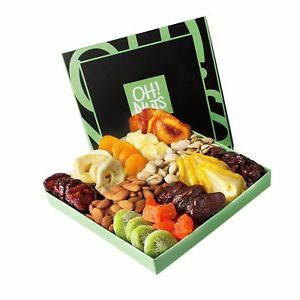 This gift basket by Oh Nuts is then likely to be a hit with health-conscious people. In it, there is Medjool dates, papaya chunks, California peaches, Turkish apricots, dried cranberries, pineapple chunks, kiwi slices, dried pears, roasted salted pistachios, roasted salted almonds, and sun-dried plumps. The arrangement within the box is quite exquisite, something anyone would love to receive. All dried fruits and nuts are of high quality. This gift is ideal if you are gifting someone more health conscious, or perhaps even vegan. They are filled with fiber, minerals, and also vitamins, making for a healthy snack on the go for the family you gift. The dried fruits and nuts are kosher too. This gift basket is ideal for those who are health conscious and vegans too. It is thoughtful as well, showing that you care about the family’s health. Marshmallows are considered a cloud of sweet goodness. Now picture yourself giving the same to someone. Not just any marshmallows, but those good enough to feature in a high-end restaurant. There are eight fluffy marshmallows in this gift basket, all flavored to take your taste buds on a journey. Oh, Nuts gourmet marshmallow gift is ideal for just about anyone. One thing is sure; the kids are bound to enjoy it. For that reason, you should aim to gift it to a family with toddlers or younger children. If you are looking to gift a sausage, ham and cheese lover, then this is the route to take. The packaging contains ham summer sausages in the flavors original, garlic, maple and honey. The cheese is also in links and wedges, all snack-sized for easy eating. Equally, one also gets mustards to go with the ham and sausage, making for a complete finger food experience. To round it up, one gets milk chocolate as a dessert to cleanse the pallet. 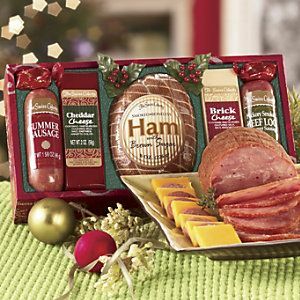 This gift box is ideal for ham and sausage lovers. You should, however, call the company before shipping. These foods are delicate and ought to be shipped promptly to avoid it going bad. Nothing says holiday more than this snack box. In it, there is a selection of holiday treats that scream festivities. The malted milk balls, honey glazed almonds, malted peppermint white chocolate pretzels, holy jolly mix, Christmas candy mix, and chocolate caramel drizzled popcorn, make for a perfect delight for a family with a sweet tooth. The ingredients are all fresh, kosher and also gourmet. Whatever the occasion, you will be more than a hit with all the sweet treats inside. This gift basket for family is best especially during Christmas but can work for any other occasion. Anyone who enjoys all things chocolate and caramel is bound to love the experience. There are white mocha coffee drink mix, chocolate chip cookies, double chocolate hot cocoa, dark chocolate caramel corn, milk and dark chocolate with caramel, dark chocolate drops, and milk and dark chocolate squares, all from Ghirardelli. 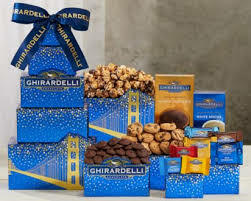 It is primarily meant to offer the very best of Ghirardelli. Equally, it is intended to be for chocolate lovers for whatever occasion. We discourage people from purchasing this product because it will be a disappointment both to them and the person they wish to gift. It is always unfortunate when a company results in false advertising to get people to purchase the product, especially when they have to part with a pretty penny. As with the previous one, the image is a false representation of what you will get. 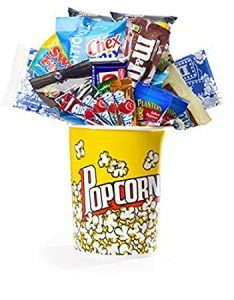 The idea of giving a family a movie night gift basket is fantastic, but you will more than disappoint them when the package arrives at their door. As per the advertisement, you are to get popcorn, a variety of chocolate, candied nuts, Cheetos and other treats that go well with any movie night. They also promise that what you get is not stale or expired, in reference to the popcorn and the snacks you get. This company is another classic case of false advertising. Though they have a fantastic concept, they appear not to care how the final product arrives into a customer’s hands. Getting a gift basket for a family can be somewhat tricky because you are gifting more than one person. If it gives you peace, though welcomed, it is unlikely that your gift will be a hit for everyone every time. Why? Finding a family where everyone has the same preference is not the norm. There are other restrictions such as dietary ones. From this brief disclaimer, it is understandable that the best gift basket for family is edibles. The reason is when gifting an entire family you want to give them something they can share. Food is that thing, and it is something that cultures around the world associate with communing. It also tends to be a safe option because it is unlikely for you to know what everyone needs and can fit into a gift basket. Another reason to opt for a gift basket is that it is something that they probably do not already buy for themselves. If they do, it is perhaps in smaller quantities. Therefore, having someone be so lavish is truly a gift for them. Ultimately, gift baskets for families have a personal touch and are thoughtful. If you wish to gift a family, it is likely that these are people that you know well. If you are lucky and have been observant, knowing what type of edibles a family likes will be easy to establish. Think of what they typically have on their counter or what snacks they prefer to serve when you are visiting. Those who aren’t as lucky, or are not well acquainted with the family, then having an undercover conversation ought to be the approach you take. The reason for this is because you should not buy what you like or what you think is in season. That is even if you do not know what they would enjoy and want to go on a whim. A gift basket should be something the receiver should enjoy. Therefore, find ways, without revealing yourself, to know what the family likes perhaps by talking to the father or mother. 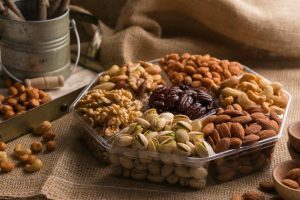 Gift baskets are not exactly the norm, so it is unlikely that they will catch on when you ask what snacks the family enjoys after sharing a story about how nuts never seem to last perhaps more than a few days when you purchase them. Food is sensitive. Nothing would be more unfortunate than receiving a basket with stale food. Apart from it being a waste of time and money on your side, it will be a sore subject for years to come. Therefore, keep in mind the food’s shelf life. Given that fruit baskets tend to contain quite a bit, you are better of getting something that can last the family a week or two. Getting the best gift basket for family can feel like a daunting task. However, with our top eight picks and two suggestions of what not to get, we hope that we’ve made the selection easier. Overall, when sending out these gifts, the message is the same; I care, and I am thinking about you. Whatever the season, you can use the above as a reference point or guide of what to gift your loved ones.